Any change after hometown episode? @AllAboutLove wrote: Sportsbet posted for Alis season in their disclaimer "Final contestant not accepting will be settled as winner". They've never done that before We discussed the unlikelihood of Ali being rejected and of her not pulling a Nick. But has any media stated Ali is with her F1? DM has stated Todd for F1 and Taite. No clear cut answer other than one relating to Sportsbet. Then again, Sportsbet has their disclaimer. @Bobette wrote: Re: the possibility of Taite refusing the final rose, I'm ruling that out because IMO if that had happened Ali would have had a MASSIVE tantie on set - and not just the polite tears we see in the preview when she IMO says goodbye to Todd, I'm talking hissing, screaming full blown insanity. If they have split it must have been post-show, IMO. Comparing Sbet to Nick's season, there was some initial confusion early on because Britt was not a clear favourite for the first day or so with her and Sophie's max losses being similar. Taite has always been a lock as far as betting goes. Also with Britt/Sophie there was that really weird $1000 max bet and we haven't seen anything like that. Not saying his behaviour isn't weird for a supposed F1 though, because it definitely is IMO. ETA: Just adding that if Taite had refused the final rose there's no way "No Winner" would be 16.00 IMO. @AllAboutLove wrote: "No winner" means the lead not picking anyone a la Nick which in this case we know that Ali will choose someone and not reject both contestants at FRC like Nick did. This season Sportsbet added a new disclaimer "Final contestant not accepting will be settled as winner" that they've never had before and means if the final contestant at RC rejects the lead, then that contestant will be the winner still. @Bobette wrote: Oh right I see what you mean now. Yeah that is new. OK, interesting. SURELY though, if he'd not accepted, DM would be all over it by now? They had tip-offs/spoilers during filming for much lesser drama such as her ousting Nathan for gossiping. Interestingly, Ladbrokes have no such disclaimer. If Taite did refuse and technically there were "no winner" they'd stand to lose a TONNE of money at 26.00. IMO Sbet is in cahoots with TPTB and added that clause to build tension for the finale and start exactly this discussion we're having now. IMO TPTB want people to think she gets refused (who wouldn't tune in to watch THAT, considering she was such an unpopular choice?!) and Sportsbet are helping create that impression (for a price, I imagine). The 28-year-old bank manager also holds 56% of the total money wagered to date. And exactly how would you know that, Daily Mail, huh huh? Max bets for both gents at $100. If Ali chooses no one, then Sbet is making some money by including that option but it not being the odds favorite.. If Ali chose Taite and they've split or still together then same old for past season. I am more inclined to believe that after Sportsbet saw the ads they decided to add that category. Also, there are other betting agencies which are also offering short odds for Taite and started earlier than Sportsbet. What they make with TB is sooo menial that no betting agency would risk their reputation and being accused of corruption by 'partnering' with TEN. What I believe (thus is my opinion) is that Sportsbet and all other agencies have many paparazzi photos Also, don't forget that we punters leave Paypal details, address, email, credit card information, etc so they can trace easily if members of a contestant's family are placing big bets. It really is very simple. For betting agencies to make money they do not need to make deal with channels and risk huge scandals that may prevent them from ever working again. The Waterhouse, for instance, have already been involved in a cheating scandal with a horse and they paid dearly for it. In general lines, though in Australia we don't have those issues because betting is highly regulated and there is a lot on stage. Entire livelihoods depend on betting, especially horse betting, greyhounds and sports. Some agencies don't even care about Reality TV. In Australia corruption over shows really doesn't happen for we have far fewer issues of corruption than the US and most of the developed world. By the way those of us who are punters can tell you that Sportsbet makes money not because of the bets placed on the the winner but with all the losers, here unlike horseracing there is no gain for placing. Anyway, I cannot wait to see the GF, and as I said unless we know exactly how much money they have in bets (the median and the amount of money placed per contestant) we cannot calculate earnings. The maximum amounts alone mean little if we don't have the other information. In the end, does it really matter? I feel that looking at the edit has personally given more clues than Sportsbet. How do you guys sleuth the US seasons? There is no betting in the US, isn't it? I'm willing to "bet" Sportsbet will be on the money once again. 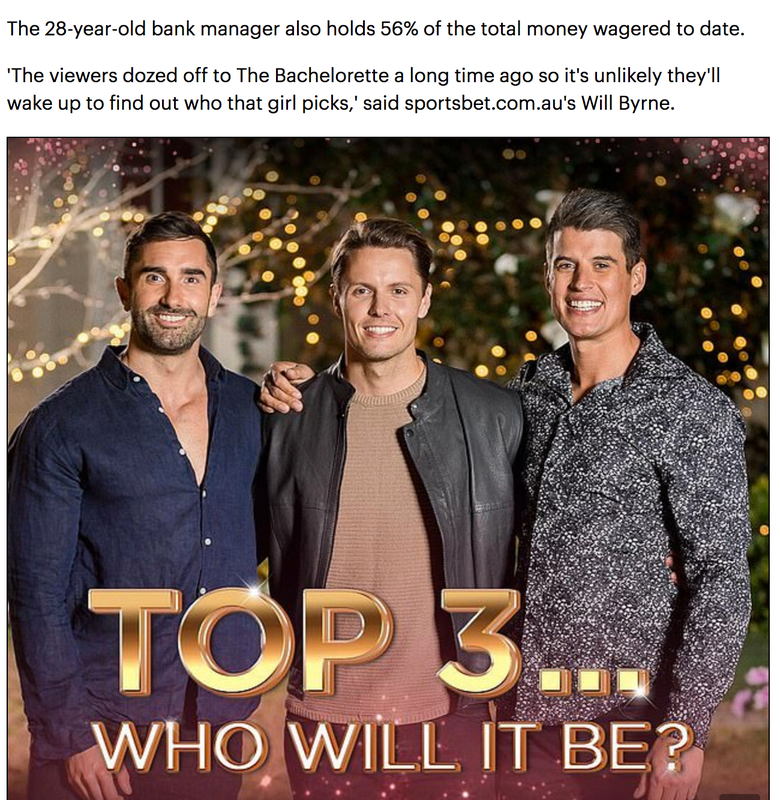 In fact it's more suss than ever this season IMO because they somehow knew to add "Final contestant not accepting will be settled as winner", yet Taite's reluctance to commit isn't something you could glean from a few long-lens paparazzi pics. The ties run deep IMO. @Popcorn For All wrote: Sundy you and I had doubts all the time because of episode 1 and also because you were aware that this year Sportsbet was wrong. I am so happy that I didn't let myself influence by the odds. Whatever happens tomorrow will be fine, but at this stage I cannot imagine Taite as the winner. He is also going to reveal something else, apparently... @sundy don't you think sleuthing is more enjoyable knowing that the betting agencies cannot be 100% trusted? In the end I saw no reason not to see Taite on episode 1. Unless Ali chooses Todd (which IMO she won't) Sportsbet are correct.